The Echoes of Holloway Prison project collected stories and objects from Holloway Prison. As part of our Object Focus series, Katherine Roberts, a project volunteer, tells us about her personal reaction to the Holloway Red Book. ‘Motherhood’ has come to the fore over and over again as a key theme in the stories from Holloway Prison and, from my perspective, has been a source of frequent surprises. Like many others, I came to this project with only a vague general knowledge of women’s experience in prison, most of which I had gathered from TV shows such as Orange is the New Black. I knew, in the abstract, that women in prison had children but my understanding was limited to the image of a woman seated across from her children during a family visit. In my mind’s eye, those children never fell under the age of five and mothers with infants or toddlers were entirely absent. The project was kindly lent a copy of the Holloway Prison Personal Child Health Record (or Red Book). This document is offered to all new mothers around the UK and a special version was produced for mothers expecting inside Holloway Prison. Reading this document introduced me to a more nuanced understanding of the experiences of mothers in prison. The Holloway Red Book is filled with familiar moments uncomfortably situated in the foreign experience of incarceration. I kept coming across questions and concerns that I could imagine any expectant mother having, where the answers were shocking to me because they were being given, not to just any expectant mother, but to an expectant mother in prison. For example, one of the questions featured in the book was ‘Can family or a friend come with me to the ultrasound scan?’ which is a question I can imagine anyone asking their doctor; however, the answer provided in the Holloway Red Book was that a family member or a friend could not come to the ultrasound because the women would not be told in advance when they would be taken for a screening. Can you imagine seeing the outline of your baby or hearing its heartbeat for the first time and having the only people to share that moment with be the technician and the prison officer assigned to you that day? Can you imagine learning that something was wrong and having no family to support you? Prior to working on this project, I had never thought about babies being in prison but, as the Red Book makes very clear, they were there. Babies could remain in Holloway with their mothers for up to 9 months. If the mother’s sentence continued on beyond that point, she could request a transfer to a prison where babies could stay with their mom for 18 months. As I had never considered babies to be part of the prison population, I had never considered what their needs might be within that particular environment. In one of the workshops that took place over the course of this project, one of the participants spoke about her work with the women in the Mother and Baby unit at Holloway, through Birth Companions. One of the programs that she helped to organize involved women from a local church coming into Holloway and taking the babies out for the day to get them used to being in stores, on buses or the underground, and surrounded by large groups of people. The point of this project was to keep the babies from becoming institutionalized, from having their only experience or understanding of the world be that of Holloway Prison. The Holloway Red Book drew my attention to restrictions and limitations that were placed on mothers in prison. One of the questions in the book asked whether the mothers could have pictures taken of their babies. This was something that I’d never thought about. It seems obvious looking at it now – after all, what could they use to take a picture? They weren’t permitted a cell phone – but in the time of Instagram, Facebook, and Twitter, where my social media feeds are often filled with pictures and videos of my friends’ children, it’s strange to think of not being able to take a picture of your own baby. What does it mean for that child to not have a record of their childhood? What does it mean for their mother? On a slightly personal (and very privileged) note, my parents didn’t have a camcorder when I was growing up; it just wasn’t something they were interested in and, as such, I have no home videos of myself or my siblings when we were kids. If the lack of video can make me feel some sort of a loss, how must it feel when all you have is a picture taken once a month? Assuming that you were only able to stay with your mom for your first nine months, that is only nine pictures for pretty much the first year of your life. What kind of a gap does that create? Curator Roz Currie writes about the Jewish suffragettes held at Holloway Prison. In 2015, while working at the Jewish Museum, I put on the exhibition ‘Blackguards and Bonnets’ exploring the story of Jewish suffragettes. I found myself inspired by the many stories of women who had fought for the vote. These included Dora Montefiore who in 1900 found her tax paying for a war that she had no say in and couldn’t do a thing about it. And Leonora Cohen whose widowed mother took on all the responsibilities of a householder without the right for her voice to be heard. Through the 19th century, as different representation acts were passed and more and more groups, including Jewish men, were enfranchised, still women and working class men had no vote. By the time the Women’s Social and Political Union was formed in 1903 it is understandable that they had become frustrated with the politicians of the day. Israel Zangwill probably expressed the question with the right level of anger, “How do they justify their monstrous proposition that one half of the human race shall have no political rights?” (From ‘One and One Are Two’ a speech given in 1907). Blackguards in Bonnets, explored just a few of the stories of the women and men who fought for enfranchisement. Rebuffed time and again, they were remarkable in keeping their eye on the final prize. This was despite the horrors of alleged police brutality and then imprisonment, hunger strikes and force-feeding at Holloway Prison. Women imprisoned at Holloway include Leonora Cohen, mentioned above, who joined the Leeds Women’s Social and Political Union (WSPU) in 1909. Her most famous act came after yet another meeting with parliament was cancelled. She filed down an iron bar so it would fit in her bag and smashed a case at the Tower of London which held some of the crown jewels. She was forced to the ground by alarmed Beefeaters and arrested. Wrapped around the bar was a piece of paper declaring: “Jewel House, Tower of London. My Protest to the Government for its refusal to Enfranchise Women, but continues to torture women prisoners – Deeds Not Words. Lenora Cohen”/ reverse “Votes for Women. 100 years of Constitutional Petition, Resolutions, Meetings & Processions have Failed.” This bar can be seen on display at Leeds City Museum. In 1912 the Jewish League for Women’s Suffrage formed, joining Christian suffrage groups, providing a platform for religious women to demand the vote without the need to engage in wider politics. The founders included women from powerful Jewish families such as Henrietta and Caroline Franklin. They had two goals –to demand that women achieved equal franchise with men, and to improve the status of women in the Jewish community. Members were clear that including women and giving them a voice could only make the community stronger. Janine opened the talk by outlining Minnie’s background and upbringing in the immigrant Jewish community of the East End of London. Minnie’s commitment to improving people’s lives gradually led her away from her family and into the radical politics of the day. While teaching in a local elementary school Minnie had campaigned unsuccessfully to raise the profile of equal pay within her union, the NUT and as a wartime organiser for the East London Federation of Suffragettes she had helped set up social welfare schemes to help women and children. In 1914, she married Edgar Lansbury, a local Labour councillor who shared her ideals and political outlook. In 1919 when the borough of Poplar elected its first ever Labour council Minnie was appointed an alderman. Her father-in-law, George Lansbury became the leader of the council. In September 1921 Poplar’s councillors and aldermen were sent to jail for an infinite period for their part in the Poplar Rates Rebellion. Janine showed photographs showing the 5 women councillors leaving for Holloway Prison amidst thousands of supporters and explained how their principled stand brought about a change in the law to benefit poorer boroughs. The Poplar councillors were released after only 6 weeks due to public outcry. Minnie Lansbury felt that the regime in Holloway Prison had severely weakened her health. Shortly after her release she caught flu which turned to pneumonia. In the days before antibiotics this was often a fatal illness. She died aged 32 on the 1st January 1922 and was mourned widely. Members of the audience appreciated Janine’s animated delivery and commented that they had increased their knowledge of both of Minnie Lansbury and the Poplar Rates Rebellion. We have been researching the lived experience of Holloway and the impact of its closure since 2016, and have been involved in various ways in the ‘Echoes of Holloway’ exhibition. This workshop was an opportunity to share some of our ideas on research methodology, lived experience, emotion and photography, and to engage in collective analysis of photographs of the empty space in the now-closed Holloway Prison. When the prison closed in the summer of 2016, Islington Museum’s curator, Roz Currie, managed to gain access to the empty building. She took more than a thousand photographs, comprehensively documenting the space and creating a visual archive for the museum, the community and for researchers. The images are striking, moving and informative: they show us the colour scheme of the prison, the facilities and fixtures, the lighting, and the contours of the space. Working with these photographs in our academic work, we have explored the potential of photographs to tell us what living in the prison was like for the women. We have also thought about the limitations of the photographs: Holloway was emptied of women and their belongings by the time the photographs were taken. We can’t know from these images what the lived space looked like, when the prison was occupied. However, the women left traces on the physical space – in graffiti, for example, and in modifications to the fixtures and the lighting – that can tell us something about what life was like in the prison. In the workshop, we presented a methodological framework for analysing these photographs, drawing on the work of Jennifer Mason (2011). Mason argues for the importance of ‘flashes of insight’ in research and sets out an approach called ‘facet methodology’ that values researcher intuition, creativity and imagination. This approach recognises that we all experience the world in multiple ways and that we can best understand lived experience by exploring various facets of experience and their connection to each other. Mason’s approach calls on the researcher to pay attention to insight – moments that unsettle, excite, move or provoke. This is an emotional methodology. We asked the participants in the workshop to analyse a set of photographs from the empty space of Holloway, paying attention to their emotional responses to the photographs. The photographs included images of the cells in Holloway, the toilet facilities, graffiti, and examples of how women modified the space, including a photograph showing sanitary towels stuck to an air vent. Participants worked together in small groups to describe the photographs, to share their thoughts and feelings in response to the images, and to imagine living in the space. They discussed whether the photographs could give us a sense of what it was like to live in Holloway, and the limitations of this approach. The discussions around the methodological approach were lively and perceptive and the engagement with images was empathetic and insightful. Participants who had been in the building while it was a functioning prison spoke about how different it looked in the photographs, prompting reflections on how much women invested in the bare space to make it liveable. The workshop discussions centred on how the photographs illustrate women’s creativity, innovation and humour – in the graffiti, the modification of lighting and fixtures, and in cell decorations. The austere environment of the prison is undeniable, but the photographs show us traces of how women tried to create comfort in the space. The conversations were moving and poignant, getting right to the heart of why and how we imprison women, how Holloway should be remembered, and public detachment from conditions in prisons. Mason J (2011) Facet methodology: The case for an inventive research orientation. Methodological Innovations Online, 6(3):75-92. Caitlin Davies, novelist, award-winning journalist and author of ‘Bad Girls – A History of Rebels and Renegades’, gave a talk at the Cat and Mouse Library and Finsbury Library about ‘Suffragettes at Holloway Prison’. Volunteer Susan writes about the event. Caitlin opened her talk by discussing about her long-standing fascination with Holloway Prison and how she had always wondered about the women inside – who they were and why exactly they were there. Her description of ‘a quick uncomfortable glance from the bus’ resonated with the audience, many of whom had done exactly the same. Caitlin then talked about some of Holloway Prison’s most vociferous prisoners – the suffragettes. These women had joined the Women’s Suffrage and Political Union (WSPU) and took part in its militant campaign for the vote between 1906-1914. Caitlin explored how they were portrayed in the press and popular culture of the time and compared that to actual events and what we know about those women who took part. While we often think of suffragettes as being middle-class single women, this was not so. They came from different backgrounds and not all chose to break the law or if in prison, to go on hunger strike. Caitlin explored how suffragettes were portrayed in the press and popular culture of the time and compared that to actual events and what we know about those women who took part. Holloway Prison where the majority of suffragettes served their sentence, was catapulted to national notoriety, even featuring in a 1910 series of anti-suffrage postcards. Caitlin discussed why so many women were sent to prison and the regime they encountered in a system set up for punishment rather than rehabilitation. However, once in prison, many suffragettes did not serve their sentences meekly. They campaigned to be treated differently – as political prisoners rather than second or third class prisoners and drew attention and publicity to the poor conditions experienced by all prisoners. Caitlin concluded by talking about the suffragettes who attempted to blow up the prison’s perimeter wall in 1913. The perpetrators were never found and authorities quietly drew a curtain over the incident. Artist in Residence of the Echoes of Holloway Prison project, Hannah Hull, took to Newington Green’s historic Unitarian Church with her band Burning Salt to launch their concept EP Dirt on September 7th 2018. It was a fitting venue for the EP’s intensely powerful songs which focus on the stories of Holloway’s past inmates, having famously had Mary Wollstonecraft as a congregant in the 18th century. Wollstonecraft’s legacy is spread across Newington Green in the form of stencil art and blue plaques, and you can’t help but feel that she would have approved of such an event taking place in a location that she once regarded as home. Hannah has previously said of the oral histories she used as inspiration for the EP; “Many of the stories left me in tears. Not just because of the horror contained within them, but also the strength”, and it was hard not to share this sentiment as Burning Salt made their way through the EP’s six carefully crafted songs in front of a back drop of accompanying music videos and projected artworks. The powerful subject matter of the songs was only aided by the venue’s intimate setting, lit almost exclusively by candle light and watched by a silent audience, transfixed by Hannah’s distinctive low register vocal and the excellent musicianship of Bobby Williams (electric guitar) and John Parker (double bass). ‘The Worst Place I was Ever Scared Of’, a love letter to the prison, and newest song ‘Born Again’, every lyric of which is taken from the transcripts of ex-prisoners, were notable highlights. The Chaps Choir waited in the wings, rising to offer backing vocals on F2052SH and filled the chapel with chanting voices in this powerful song named after the form used to report self-harm or suicide in prison. If the Echoes of Holloway Prison project’s purpose was to capture the stories of the prison, then the DIRT EP has managed to bring these stories to life in an alternative fashion. These emotive songs help the stories to resonate in a unique way, and never more so than when showcased live in this most perfectly suitable of settings. DIRT is available on all major streaming platforms, and for digital download via www.burningsalt.com. Please get in touch with Roz.Currie@islington.gov.ukto receive a free download code. View 3 music videos from the EP here. Hannah also produced a limited edition booklet entitled ‘Echoes’ which includes a series of short poems and a selection of photographs of the prison taken by Roz Currie just after its closure in 2016. This is available for free at Islington Museum. 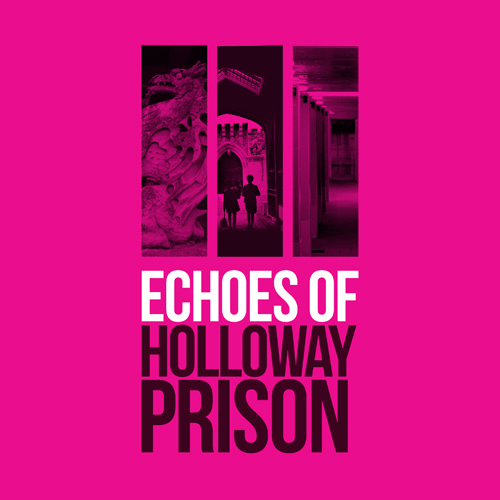 One of the overriding themes taken away from the Echoes of Holloway Prison project, is the idea of Holloway as a network – a network of women held or working there, of local organisations providing support services,and of the wider community. From the early beginnings of Holloway, women have campaigned together to improve the living conditions of women held by prisons and their lives once they leave. They range from individual activists and women with personal experience of offending, to established support organisations, each with an inspiring journey to share. The Treasures Foundation was founded by Mandy Ogunmokun in 2011, who herself was held at the prison. They offer support and guidance to women with a history of drug abuse and offending, through three houses in East London, and were recently awarded funding from SEGRO to benefit the organisation’s Independent Living groups. Working Chance, founded by Jocelyn Hillman in 2009, provides recruitment support to women. Based on her experiences meeting women held in prison, Hillman saw the need to change the stigma many women formerly held in prisons feel they face by potential employers and society once they leave. The group now have offices in London and Manchester, and run a recruitment office inside HMP Downview in Surrey, where many women from Holloway are now held. Birth Companions provides free support to pregnant women and new mothers in prisons, including advice, group sessions, resources, and taking photos for the new mother and her child. The organisation developed from the ‘Holloway Doula Group’, which was created in response to reports that women in prisons were giving both without any friends or family around them. They provided support for women at Holloway for 20 years until the site closed, and now run weekly groups for women at Bronzefield and Peterborough prisons. Women in Prison was also founded by a woman formerly held at Holloway in the 1980s. Chris Tchaikovsky, alongside criminologist Pat Carlen, founded the group in response to the conditions she witnessed at Holloway, and as a means to campaign for change in the criminal justice system and provide support for those women impacted by it. They provide support inside and outside prisons in England, as well as a series of women’s centres across the country. They also produced ‘After Holloway’ in 2015, alongside the Centre for Crime and Justice Studies, a study of 50 asking 50 women affected by the criminal justice system whether the closure of Holloway has had an impact. The Griffins Society was founded in 1965 with the aim of providing hostel accommodation to women leaving Holloway Prison, and was named after the two statues of griffins holding keys in their claws originally placed outside the prison’s gates. The group’s main aim is to bring about change to the criminal justice system by sponsoring practitioner-led research to inform wider policy. As part of the Echoes of Holloway Prison exhibition events programme, a North London Sisters Uncut representative ran a ‘Reclaiming Holloway’ workshop at Islington Museum, to address issues surrounding women’s prisons, as well as the group’s occupation of Holloway Prison Visitor’s Centre in May 2017. The workshop explored the purpose of the week-long occupation, which was to protest government cuts to domestic violence survivors’ services and to urge that the site be used as a safe space for women and the local community. By hosting a community festival at the site, activists hoped to show that a community space was not only feasible but also popular in the area. The session also provided a chance to see plans showing the community’s vision for the site, which offered a fascinating insight into the needs and wants of the local community. To end the workshop, Sisters Uncut facilitated a wider discussion about what can be done to stop the cycle of women being held in prisons. The varied group of criminal justice and architecture students, community members, and museum staff and volunteers shared stories and ideas about ways in which women could be better supported. Items from the occupation, including banners hung from the prison, were displayed in the Echoes of Holloway prison exhibition (13 July-8 October 2018).